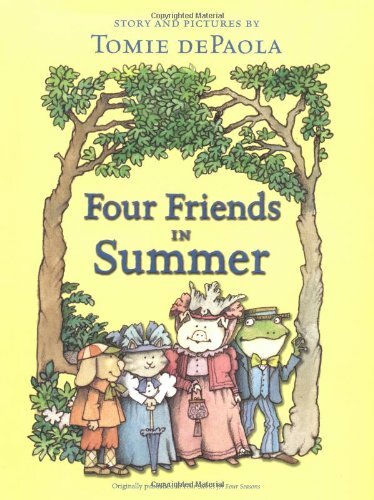 PreSchool-Grade 2-Previously published as two chapters ("Spring" and "Summer") in Four Stories for Four Seasons (Aladdin, 1994) and repackaged here as a single story, this offering is pleasant, but slight and a bit disjointed. In gentle, easy-to-read language, dePaola introduces four friends-Master Dog, Missy Cat, Mistress Pig, and Mister Frog-all colorfully dressed in Victorian garb. While strolling through the park on a sunny day, they decide to take a rowboat out on the lake. One thing leads to another and all four tumble into the water. Missy Cat is the only one willing to try boating again, so the friends agree to do something they all enjoy, and each one plants a garden. At the end of the summer, they share their results by visiting all four gardens, and discover that each one is singularly appropriate to the personality of its owner. The pictures convey very little action as nearly all of them are group portraits of the animals with sweetly winning expressions on their faces, but the measured pace is appropriate for beginning readers. A mild friendship story that's warm but not exciting.